Once upon a time, I had a vision. Not only would I bring back side ponies, but also a controversial relic of my youth. Once banned in schools all across the U.S., these bad boys are coming back with a bang slap. Sorry, I’m all outta stock now, but stay tuned for the next amazing giveaway! GoGuiltyPleasures Slap Bracelets Giveaway – Yeah. 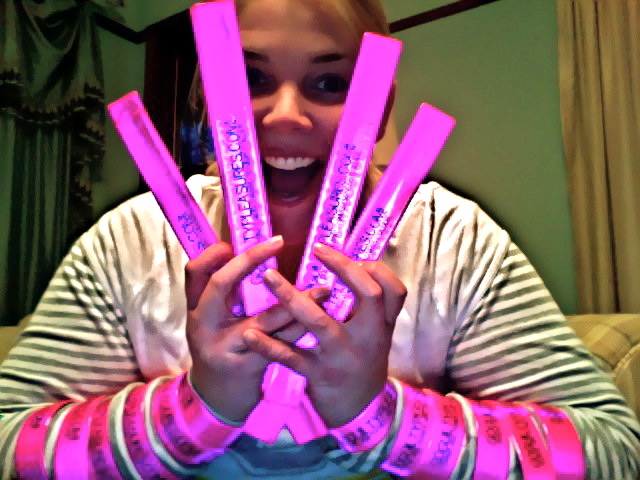 I said SLAP BRACELETS!)! Pingback: How I Feel About Naked “Girls” on HBO | Go Guilty Pleasures! Pingback: It’s All in My Noodle, Right? | Go Guilty Pleasures! Pingback: Oh, Please, No. MY Childhood Relived?! | Go Guilty Pleasures! Pingback: Slap Bracelet Pictures: June 6th Deadline! | Go Guilty Pleasures! Pingback: Second Husband & Go Jules Go: Our First Conversation | Go Guilty Pleasures! Pingback: Snakes Aren’t Scary (Except When They Are) | Go Guilty Pleasures! Pingback: Slap Bracelets Comeback – The GRAND (Oh, it’s Grand) Finale! | Go Guilty Pleasures! I feel like I’m showing up late to the Slap Happy Party. Like Buying a Pet Rock in 1990 or a Rubik’s cube in 1999. Sighhhhhh But at least I still get to laugh! Great idea! I ordered them online! There are a ton of places that do custom slap bracelets, but just a note – I couldn’t find anywhere that did them in quantities less than 200! who was conducting a little himework on this. talk about this matteer here on your site.